LONDON — Saudi Arabia has moved a step closer to purchasing a second batch of Typhoon fighters with the signing of a memorandum of intent with the British government to acquire 48 jets from BAE Systems. The preliminary agreement to move forward on the long running negotiations to purchase the Typhoons came at the end of a three-day visit to Britain by Crown Prince Mohammed bin Salman. “We have taken a vital step towards finalizing another order for Typhoon jets that will increase security in the Middle East and boost British industry and jobs,” said Defence Secretary Gavin Williamson. Completion of the deal would come as a major boost for Britain’s combat air industry, just weeks after the government here announced plans to conduct an industrial strategy review of the sector to map out future skills and resources required beyond Typhoon. Aside from BAE, the U.K. arm of Italian aerospace company Leonardo is a major supplier of avionics for the jet. Rolls-Royce is involved in building the jets engines for the Typhoon and dozens of smaller local companies are also in the supply chain. Nearly 15,000 people are employed in the Typhoon supply chain in Britain, with thousands more jobs supporting manufacturing in Eurofighter partner countries Germany, Italy and Spain. The Typhoon is built by the Eurofighter consortium in which Airbus and Leonardo have a stake alongside BAE. A deal could involve some assembly of the Typhoons in Saudi Arabia in support of the Vision 2030 economic reform program being implemented by the government in Riyadh, said industry sources. Increased Saudi industrial involvement in Typhoon was hinted at in a statement released by Charles Woodburn, BAE’s CEO. “Today’s news is a positive step towards agreeing on a contract for our valued partner, the Kingdom of Saudi Arabia. We are committed to supporting the Kingdom as it modernizes the Saudi Armed Forces and develops key industrial capabilities critical to the delivery of Vision 2030,” said Woodburn. BAE already undertakes subassembly of Hawk trainers in Saudi as part of a 2015 deal to equip the air force with 22 of the jets. Along with the large, and lucrative support contracts for Typhoon, Hawk and Tornado jets, the British company employs some 6,000 people in Saudi — the majority being locals. The Saudis already operate 72 Typhoons from a first batch of jets ordered from BAE in 2007. The final jets from that order were delivered in the first half of last year. The 2007 deal included an element of Typhoon assembly in Saudi Arabia but that requirement was eventually ditched as being too ambitious. Commercial negotiations between BAE and the Saudis over the terms of the new deal are ongoing. 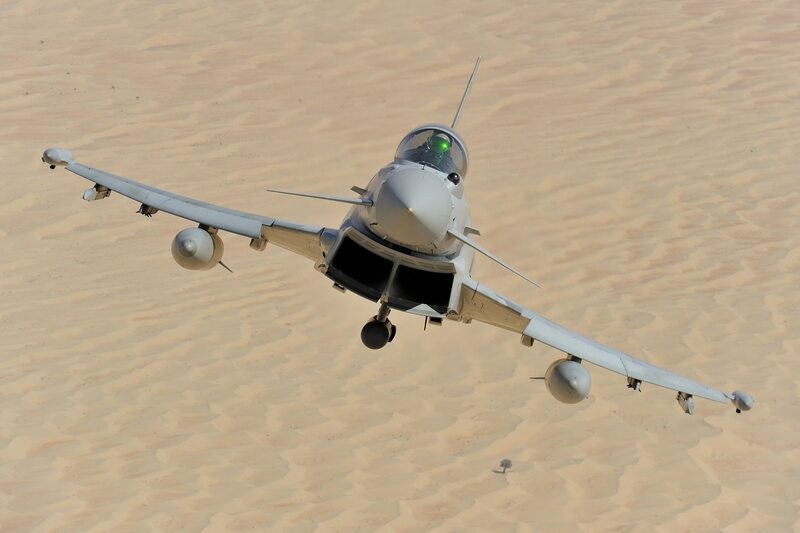 Late last year the British sold 24 Typhoons to Qatar in a deal valued at around £5 billion (U.S. $6.9 billion). Unusually the two governments went from signing a memorandum of intent to BAE concluding the deal in just three months. Industry executives though caution against such a rapid conclusion to negotiations this time around. Aside from the Saudi air force, Kuwait, Oman and Qatar have also ordered the Typhoon in the Gulf region.